Many homemakers and modern families are considering the freedom of working from home, to ensure that they're always available for their children (among a myriad of other reason). But working from home isn't an easy task, in fact it may be overwhelming to work from the kitchen or dining room table, among all that mess and noise. Today we present you with an adorable and beautiful alternative for a home office space; one that you might not have previously considered. 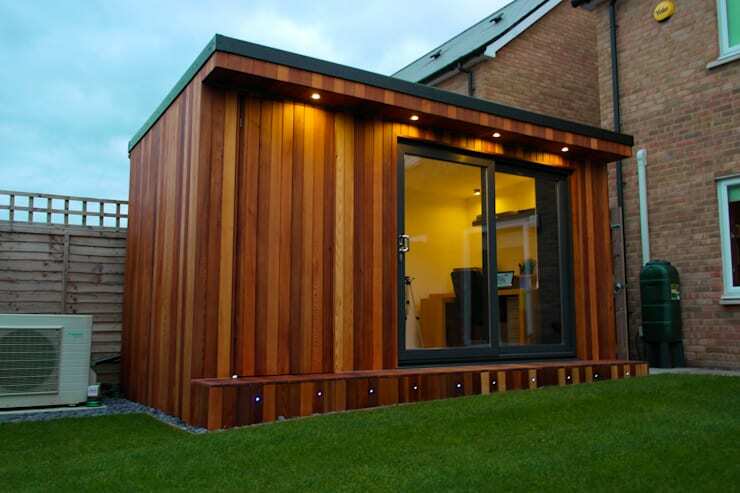 It's a wooden prefab structure that can act as a storage space, as well as a comfortable, sleek workspace or just somewhere to get away. Never worry about the kids screaming through that important phone call with a client again. Our first glimpse at the wooden structure displays its compact but striking stature. From this perspective it seems like an adorable yet stylish shed with elegant lighting and clean, geometric lines. 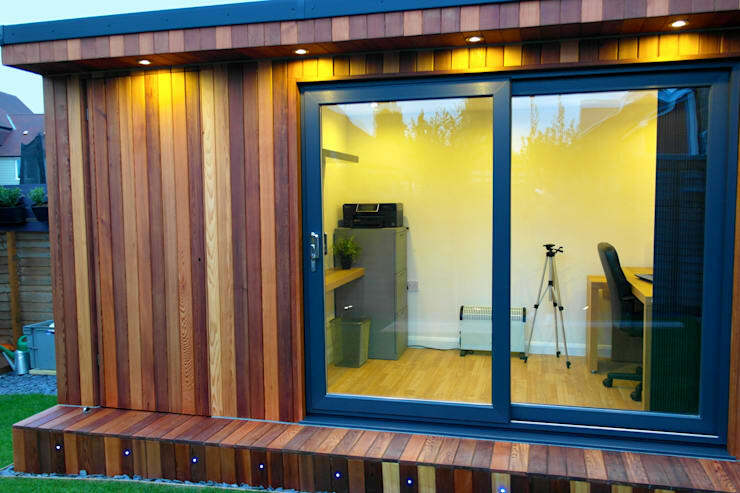 The modern prefab workspace is easy to build and set up, adding a chic look to the garden too. Here we can see that the structure is not very wide either, but the architects ensured that its wooden panels, dark roof and windows can fit into any garden without taking up too much space. The top view of the garden office allows us to sneak a peek at the interior. It's a pretty box filled with cosy artificial lighting, and we cannot wait to see more. The recessed lights located outside the office will come in handy at dusk, when heading inside for a good meal is mandatory (obviously!). 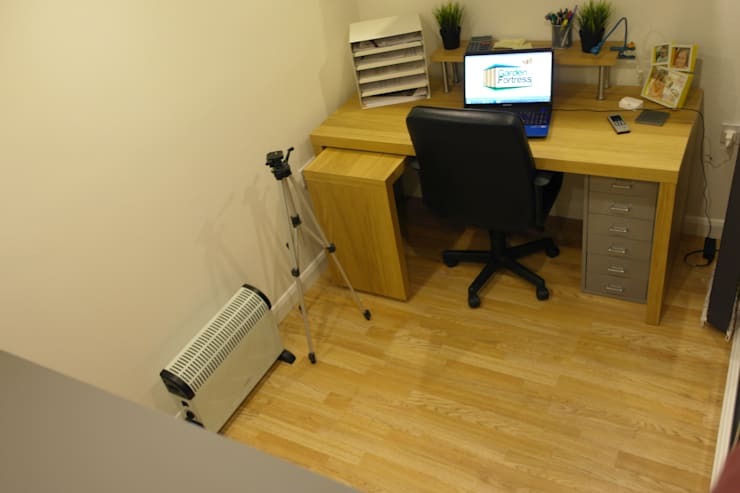 The office has space for a desk, chair and even office supply storage and filing, which is much more than you'd get crammed somewhere in the main house. The interior is viewed through a sliding door, which offers inspirational views of the exterior. So whether you're a writer, designer or accountant, sometimes time off is all you need to be refreshed again. On the one side we have a usable modern office space, while on the other, we can store all or garden essentials, appliances and tools. Whatever you choose to use the space for, this wooden outdoor unit will ensure that the home and garden remains neat, tidy and organised. 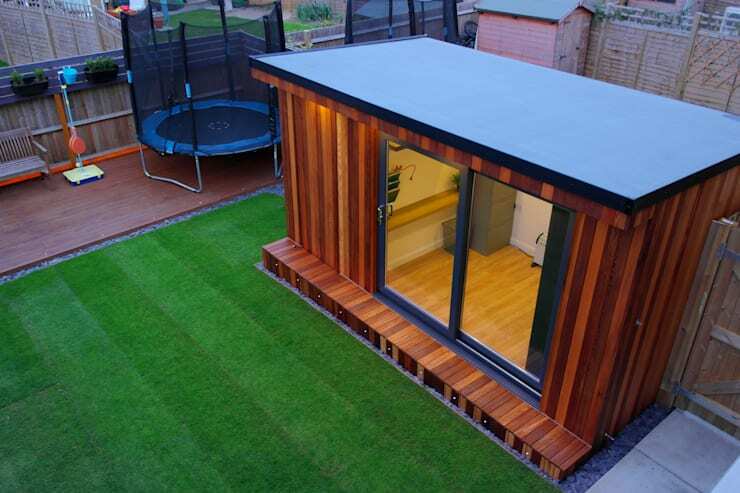 It's the perfect option if you have a spacious outdoor area and not quite enough room in your house. No need to clutter up your garage or overstuffed storage cupboards anymore! 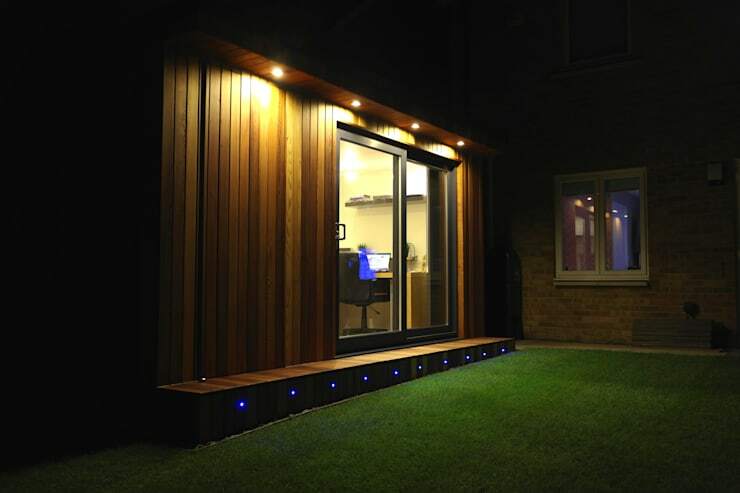 The office may be used at any time of the day or night, so whether it's important phone calls you need to make during the day, or the deadline you're pushing until the early hours of the morning, this structure will ensure that you have privacy, freedom and serenity in which to complete your work on time. Now, we finally show you what the office looks like inside. There's more than enough space to work, keep your files in order and even add some inspirational quotes and motto's to the walls—if that's your thing. The neutral colour flooring works well with the desk, adding very little extra distraction to the office, therefore maintaining a serious tone. 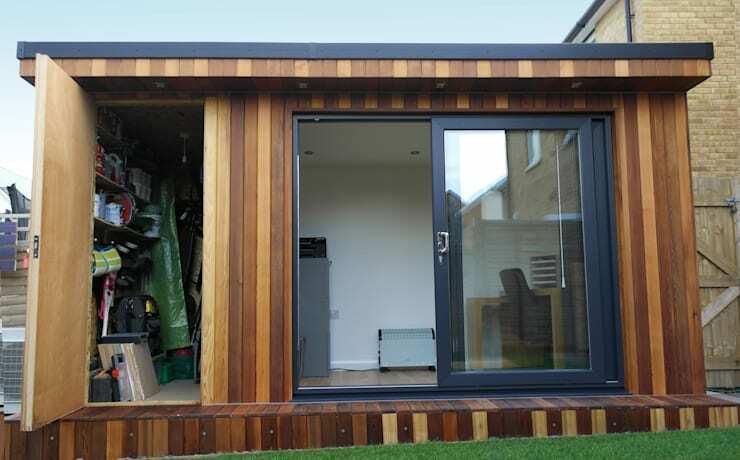 If you liked this office shed idea, then consider The Sizzling Forest Sauna for another small but relaxing relaxing experience. Would you consider this as a great home office?